Windrush is the site for the Metamora Combined Driving Event each year as well as other club activities. It is situated in the midst of Metamora Horse Country. The 300 acre farm is owned by club member Barbara Chapman and her husband Frank Andrews who graciously allow us to play with our horses and carriages on their property. The original house and barn on the farm were built in 1860. Recently, a magnificent, Kentucky style barn, complete with indoor driving arena was added. 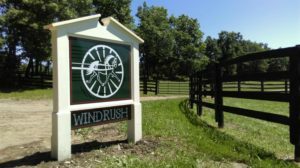 Windrush Farm is located about 8 miles Southeast of the city of Lapeer and 2 miles east of the Village of Metamora. It is accessible from the major East-West highway I-69 and North-South road M-24. From I-75: Take Lapeer exit, 81 (M-24). Go North on M-24, 19 miles to Dryden Road, approximately 3.6 miles, to Barber Road. Turn South (right) onto Barber Road. Windrush Farm is 0.6 miles on the left. Follow the MCDA signs. From I-69: Take Lapeer exit, 155 (M-24), go South approximately 7 miles to Dryden Road. Turn East (left) on Dryden Road, approximately 3.6 miles to Barber Road. Turn South (right) on Barber Road. Windrush Farm is 0.6 miles on the left. Follow the MCDA signs.